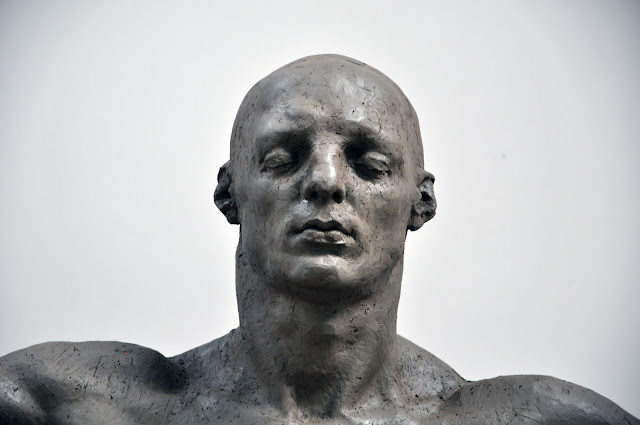 If you are a returning reader, I hope that you have found a moment to explore the sculptor Grzegorz Gwiazda’s website. You may have read his biography. Perhaps even Marco Izzolino’s fascinating exhibition essay ‘Gwiazda the heretic’. Yet, if you read my last blog, you may recall I referred to Grzegorz as an ‘enigma’. Despite having read much about Grzegorz’s training, his sculptures and his successes, he retained an air of mystery about him. It left me wanting to know more about what makes him tick. So, in our interview, I began to probe further, to flesh out the facts. Detail of Anointed, 2013. Photo courtesy of the artist. It was whilst Grzegorz was at secondary school that he first began to entertain ideas of pursuing an artistic career. Initially, he hoped to be a painter and took part in various competitions, gaining honourable mentions in both of the two-week events organised the Academy of Fine Arts, Poznań and the Academy of Fine Arts, Gdańsk. 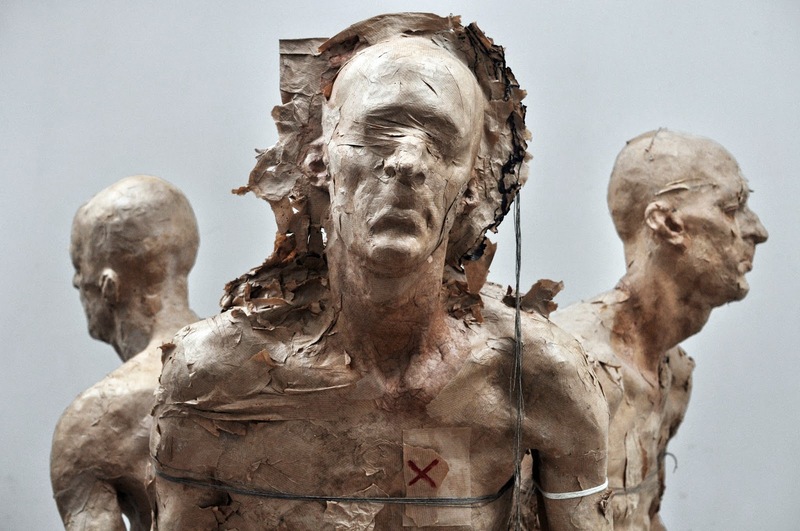 However, it was these events that convinced Grzegorz to ‘dedicate’ his life to sculpture. He witnessed how painting was entirely natural to the other artists and realised that this was how he felt about sculpting. Grzegorz’s passion for sculpture grew each year and as his school days drew to an end, during a visit to the south of Poland he came across a monument by Jan Kucz. The power of this monument ‘crushed’ him, he felt he ‘didn’t want to leave the sculpture’. Just three years later Grzegorz was sculpting in Kucz’s studio! But what route did he follow to get there? Anointed, 2013. Photo courtesy of the artist. In Academy of Fine Arts in Poznań, Grzegorz studied in the studio of Professor Wiesław Koronowski. He attended a whole range of classes; painting, drawing, anatomy drawing, technical drawing, psychophysiology, anthropology, history of art and contemporary art. Sculpture itself was taught only twice a week. But, that didn’t deter Grzegorz. He sculpted almost every day. His first assignment was a life-size clay figure caught in contrapposto. Having gained a technical foundation, Grzegorz then moved to Warsaw. Ewelina, 2012. Photo courtesy of the artist. Sculpture classes were taught four mornings each week, always in reference to a live model. Drawing and theory filled the afternoons. The fifth day was given over to technical classes, from bronze-casting to stonecutting to ceramics and so on. Soon after, Grzegorz truly began to ‘discover and name elements’ of his own style. Nowhere more so than when on Erasmus at the Accademia di Belle Arte di Brera in Milan. Detail of Heretic, 2014. Photo courtesy of the artist. Although this financial support was fundamental in enabling Grzegorz to sculpt, he soon discovered that the greatest benefit was discovering he was ‘believed’ in. This encouragement came following his recent graduation, when he needed it most. Heretic II, 2013. Photo courtesy of the artist. Seeing a sculpture through to completion is a long process for Grzegorz, though he hates to leave work ‘half way’. It starts with a concept or a narrative. Grzegorz first pinpoints exactly what it is he wants to say. Sometimes maquettes and drawings follow but ‘there are no rules’. Often the composition is uncomfortable for the model to hold, so Grzegorz also works from photographs. He thinks with his hands, selecting elements from the model rather than simply re-creating. Grzegorz ‘allows the story to appear’. Sketch for Cyclist, 2014. Photo courtesy of the artist. 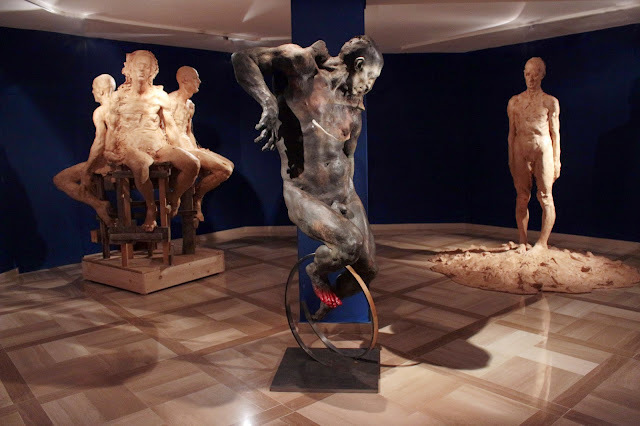 ‘In 2010 his work Behold the man (Oto Człowiek) was honourably mentioned in the international competition of figurative art organized by Fundació de les Arts i els Artistes. Yet Grzegorz doesn’t dwell on his successes. Instead, he describes how the perception of the viewer has changed drastically in his lifetime due to influences such as television, the internet and even the use of colour in magazines. In comparison to these mediums, Grzegorz’s materials, technique and processes might even be judged as traditional. Like many figurative artists, he is faced with the challenge of accessibility. Cyclist, 2014. Photo courtesy of the artist. Recalling an anecdote from his student days, Grzegorz describes how he and a friend were exhausted after a night’s partying. Just before falling asleep, his friend said: ‘In art the most important thing is contrast and mystery’. I wonder if his friend is even aware of how this comment has stayed with Grzegorz. He abstracts elements of his sculpture, thus creating mystery. Accessibility follows… the viewer wants to know more. As for technology itself, he believes ‘photography didn’t kill painting… it released painters’. Grzegorz is not threatened by 3-D printing. He believes that works made in a traditional manner have a unique, instinctive, natural ‘energy’. 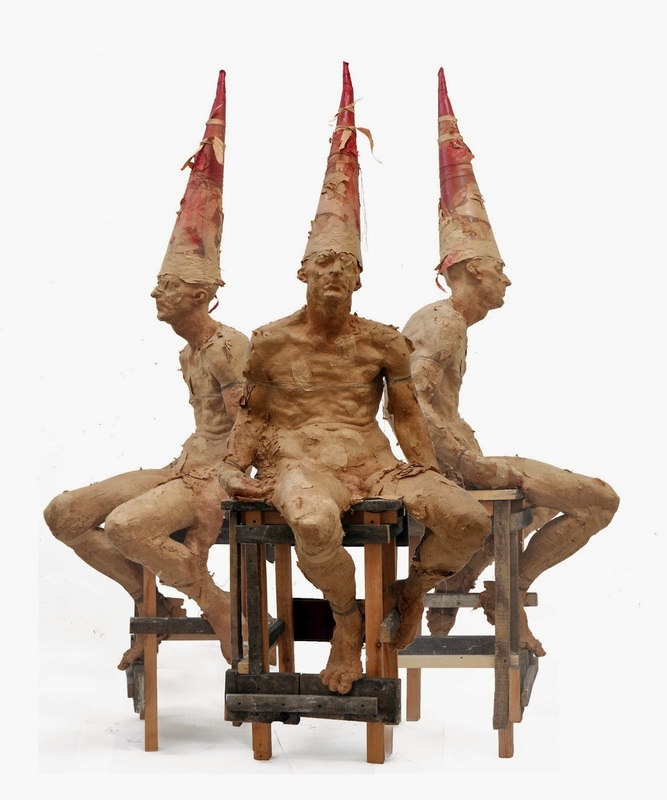 Grzegorz delights in forming clay - the situation is simple, ‘people just need it’. Dead Minotaur, 2013. Photo courtesy of the artist. Grzegorz is glad such exhibitions allow his works to be seen by other artists... he gets so much more by viewing art in person than in photographs. 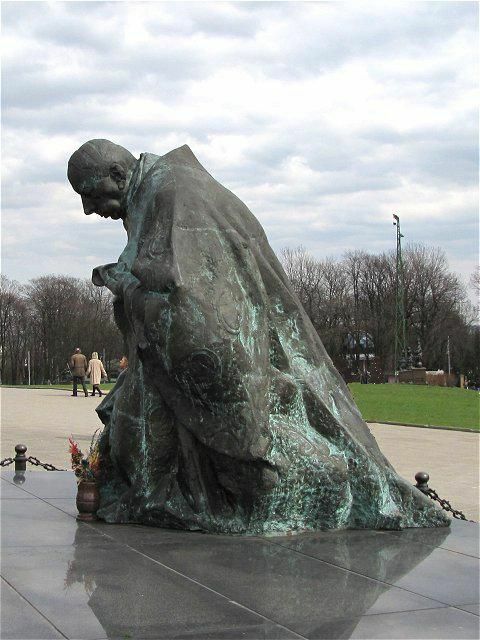 Only when in proximity to the work of his favourite sculptures does Grzegorz learn. 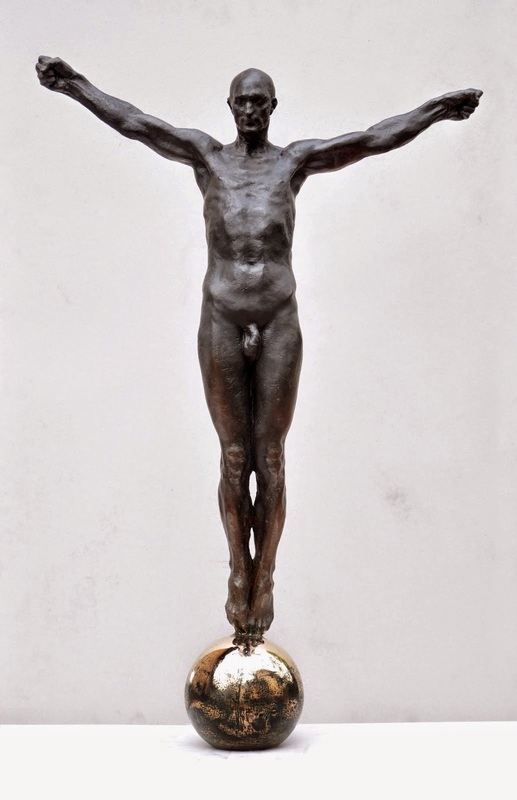 Polish sculptors, working in the second half of the 20th Century, are Grzegorz’s greatest inspiration. His favourites include: Adolf Ryszka, Gustaw Zemła, Jan Kucz, Jerzy Jarnuszkiewicz and Adam Myjak. However, he also turns to the work of the Northern Renaissance, Rogier van der Weyden and Pieter Bruegel in particular. More recently Grzegorz has discovered a deep appreciation of the Chinese sculptor Li Xiangqun. Exposure, 2011. Photo courtesy of the artist. One of the things I discovered about Grzegorz that is perhaps less well known, is the ferocity with which he champions Polish sculpture. Currently he is working with the Museu Europeu d'Art Modern in Barcelona and the Academy of Fine Arts in Warsaw on the preparations for an exhibition of Polish sculpture of the 20th and 21st centuries. Grzegorz is much more than an artist. He is a committed, passionate participant of the arts. Watch out for Grzegorz … we’ll be hearing more about him in the years to come. Of that I am sure. Various works on diaplay at a recent exhibition at Square Galley, Positano, Italy. Photo courtesy of the artist.